The hot forging manufacturing process is performed at extreme high temperature (up to 1150 °C for steel, 360 to 520 °C for al-alloys, 700 to 800 °C for cu-alloys). This temperature is necessary in order to avoid strain hardening of the metal during deformation. Stamping is the most widespread hot forging manufacturing process, where the material is squeezed in a press, between a tool and a die surface. The high temperature during hot forging enables the highest possible level of material deformation and the access to complex 3D geometries. 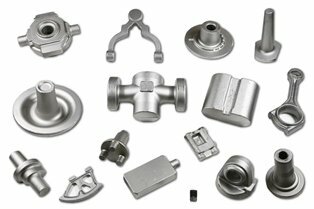 Hot forged components possess increased ductility which makes them desirable for many configurations. 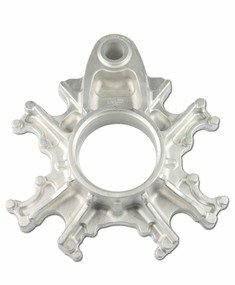 Also, as a technique hot forging is more flexible than cold forging, since customized parts can be manufactured. The excellent surface quality allows a wide range of finishing work as polishing, coating or painting, tailored to customers’ specific need. Hot forging materials are available all over the world which has a positive impact on their final price. The properties of hot forged metals are obtained by subsequent heat treatment, where the material has been quenched to 1000° C and then returned to 500 ° C. This requires additional cost, which can be avoided if using cold forging (except in some cases as softening, annealing or relaxation). Less precise dimensional tolerance is another possible disadvantage of hot forged components compared to the cold forged ones. The cooling process should be also performed under special conditions; otherwise there is a risk of warping. Also, the grain structure of forged metals may vary and there is always a possibility of reactions between the atmosphere and the workpiece.